When we decided that our round the world adventure would take us through Spain, I knew that a stop in Granada was a must. Why may you ask? 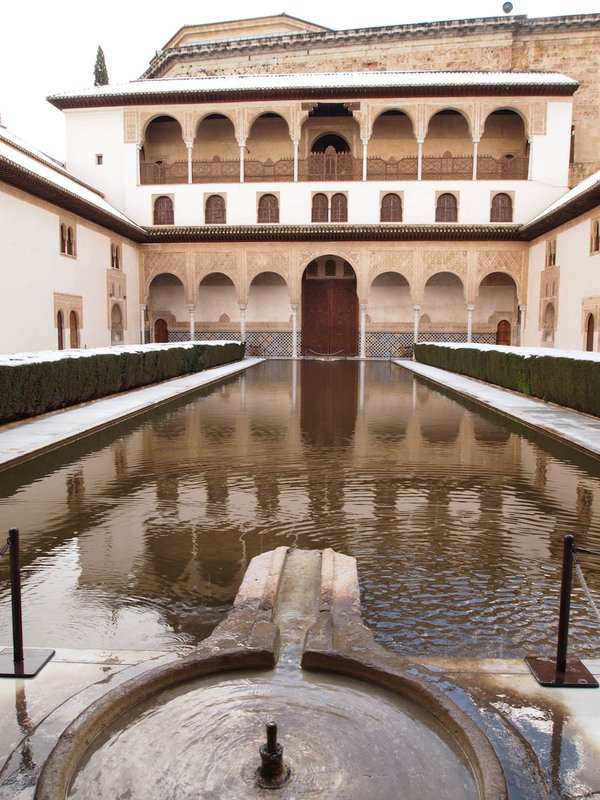 It was all because of this “little” palace on a hillside towering above Granada called Alhambra. Everything I had seen and read about Alhambra made it look amazing. 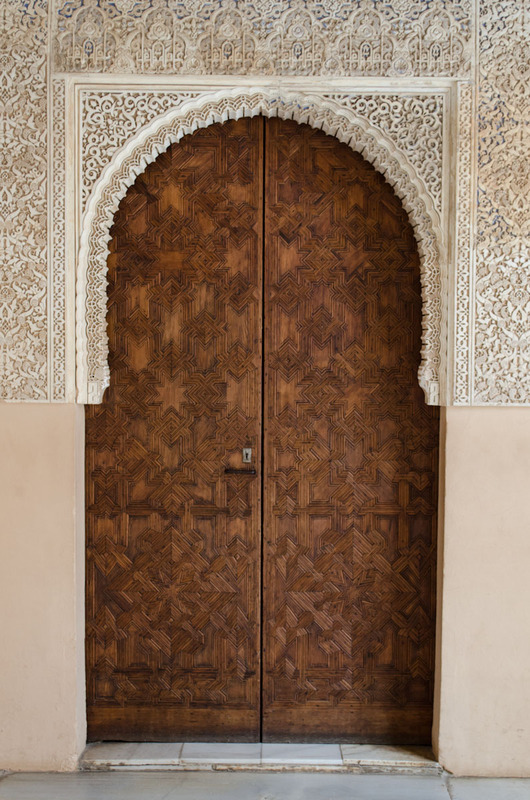 When we were initially looking at where to stay in Spain, we had thought about staying in Granada for the entire month given all its history. However, all the housing that we found was way too expensive for us. We decided to save seeing Granada until the end of our month stay in Spain. We would be using it as a halfway point between Denia and Algeciras where we planned to catch the ferry to Tangier, Morocco. To help keep costs down, we planned to only stay 2 nights. 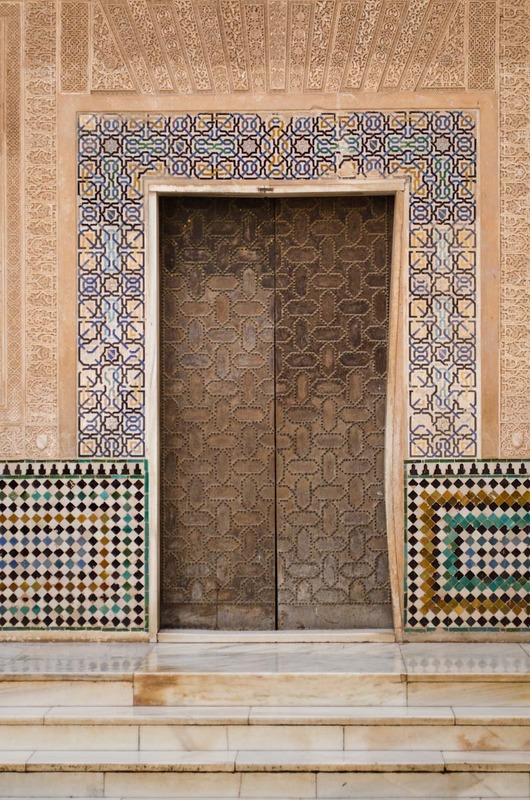 In researching Alhambra, it is strongly recommended to buy tickets in advance, otherwise there is the high chance of not being able to get in. The tickets have a set time for when one can enter the main palace with no option for a refund. As recommended, I dutifully bought the tickets online in advance. We also booked a lovely hotel in near the center of Granada. With this being said we were set except for one tiny thing that we did not plan for. Being in Denia for most of the month of February, we had been enjoying warm weather and lots of sun. We had forgotten that it was after all February and still the middle of winter. As we drove to Granada, the hills became progressively higher and changed to mountains. These mountains eventually became snow covered. 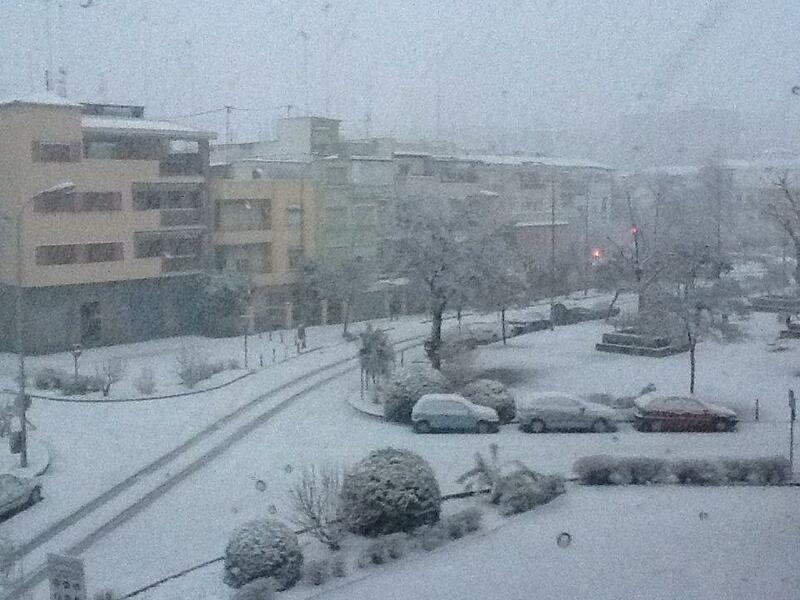 Oops, in all our preparation we had forgotten to check the weather and elevation of Granada. Jason and I became worried about the possibility of encountering snow on the road, as we did not have studded snow tires or chains. Luckily for us, we did not encounter any snow along the drive. Granada is located at the base of the Sierra Nevada Mountains. The first evening we arrived, we had a lovely time walking around town, getting oriented to the streets, and hopping from one tapas bar to the next. I was in heaven, finally finding the delicious foods of Spain in those simple tapas dishes. It was a little cold out, but overall a very nice evening. However, when we awoke the next day there was a good 2 to 3 inches of very wet snow on the ground with fatty flakes still falling. Yikes! Sydney, unfortunately, did not have any boots, just hiking shoes that are not even close to being waterproof. Knowing that we had these nonrefundable tickets for Alhambra for the afternoon, we thought we would just go out and find some boots. Easy peasy, right? Well this did not turn out to be the case. First off, Granada has this love for polished stone sidewalks. Let me tell you, slushy snow and polished stone sidewalks do not mix. It becomes slicker then well I guess you could say snot! Most storefronts in Granada have a cover, creating about a 2-foot section of “walkable” sidewalk. Thus began our slow progression into the center of Granada, walking along the 2-foot section clinging onto the storefront walls and windows for support. Of course, we were not the only ones trying to get somewhere that day, so started the game of who can edge the other person out onto the slick sidewalk. 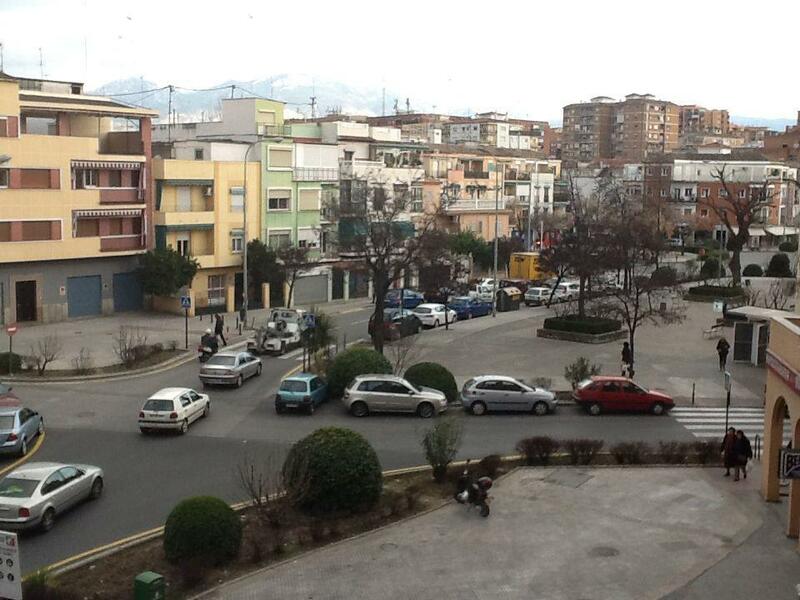 The other issue, apparently Granada is a lot like Portland in one aspect, when it snows all the shops shut down. After leaving our hotel, Sydney’s shoes were thoroughly soaked within in a couple minutes. Being undaunted, we continued our hunt for boots. As we navigated the sidewalks of Granada, Sydney became progressively louder with her complaints of freezing feet and was more mutinous by the moment. We finally decided to call off the hunt for boots and we returned to the hotel room for lunch, to get Sydney into a bath, and to change into dry clothes. I spent my lunchtime trying to dry out Sydney’s shoes with the complementary hotel blow dryer with some success. Luckily during lunch the sun also decided to come out and began to melt the snow. 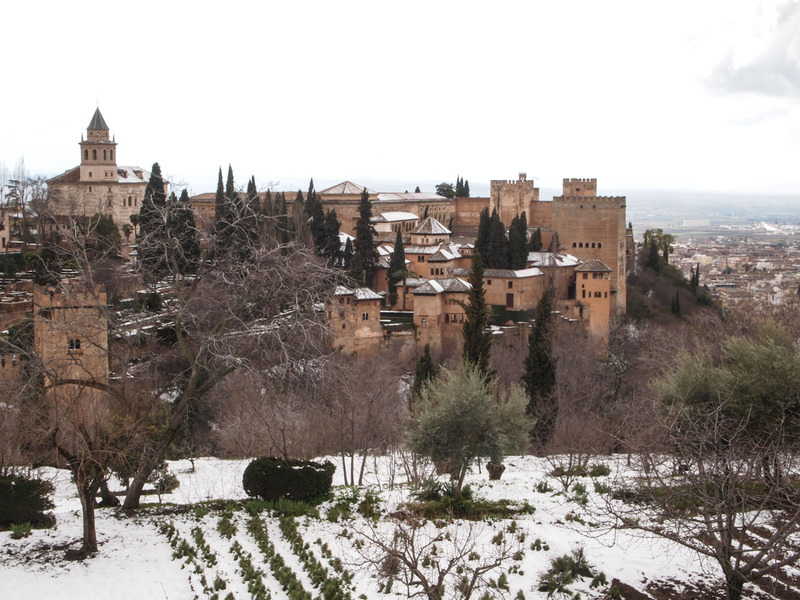 Being undeterred by the weather, we set off for Alhambra in the afternoon. In an effort to keep us somewhat dry and Sydney happy, we took a taxi up to Alhambra. 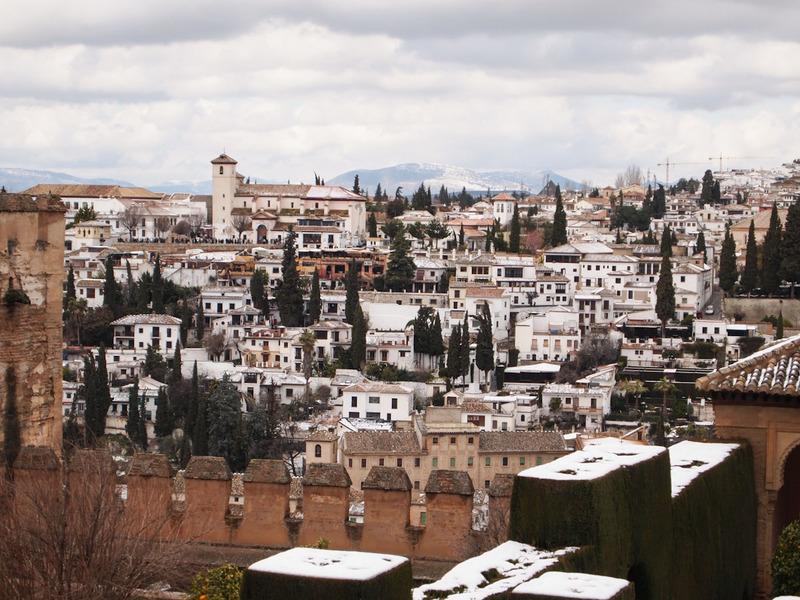 The Taxi slowly drove us along the winding streets of Granada to reveal a most spectacular site. Wow! I can now see why Alhambra attracts over 8,000 visitors per day and is an UNESCO world heritage site. Pictures do not even begin to capture the beauty of this place. 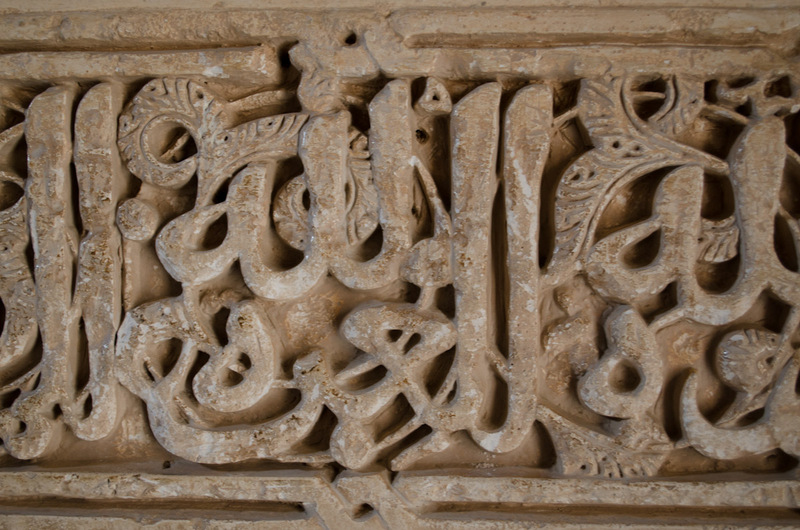 Alhambra was built in 889 and was added on over the years to include several palaces. 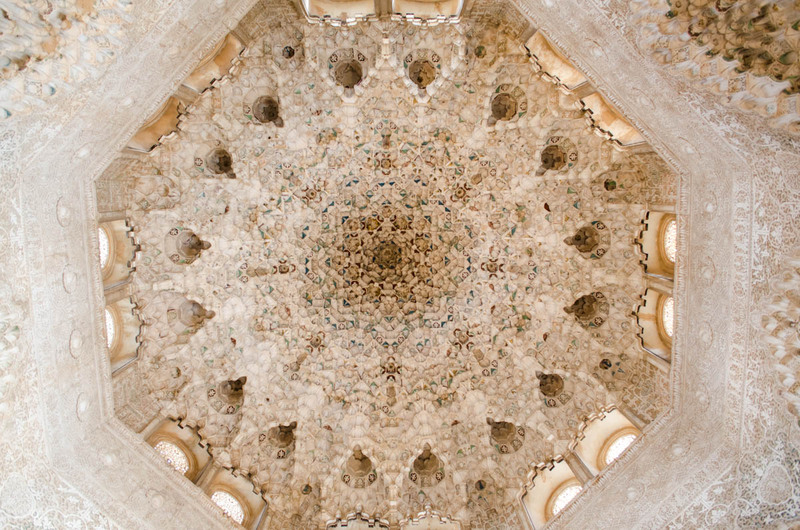 The main Moorish palace, Palacios Nazaries, is covered in intricate carvings and tile including the ceilings. Several of the palace room ceilings contain dripping stalactite looking features. Every room in the palace also seems to have a water feature in it. 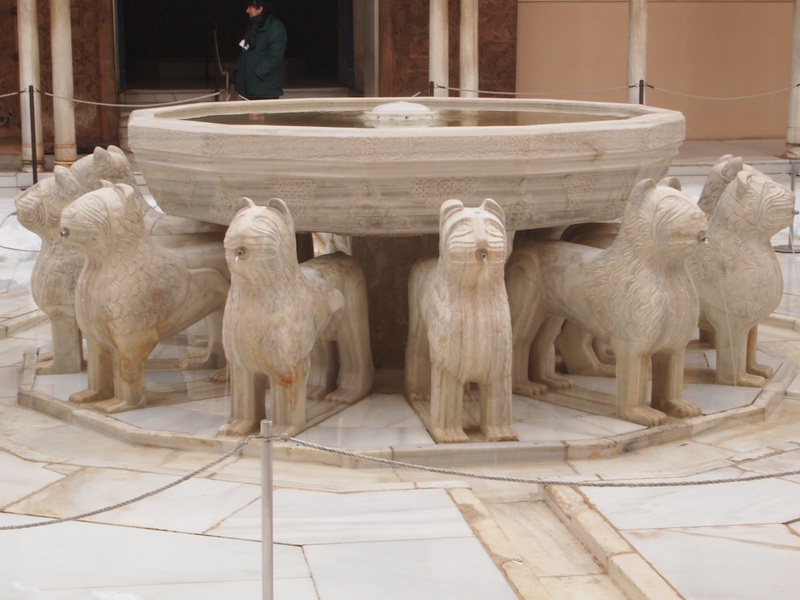 Some water features are as simple as a bowl carved into the middle of the floor with a fountain. Many of the rooms open up to beautiful courtyards with water features. It must have taken years to complete building this palace. But besides the beauty of the place, I kept on wondering how many times over the ages had some poor person ended up with wets shoes due to not watching were he or she was walking and stepping into a fountain. 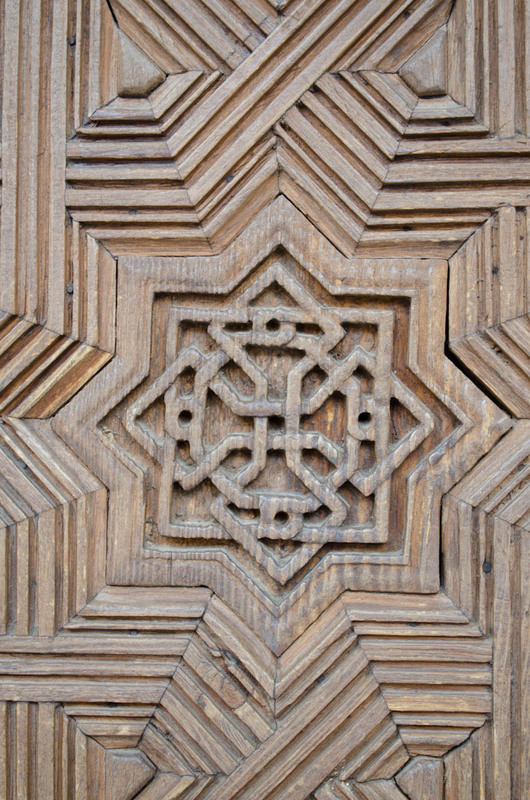 Jason and I enjoyed the afternoon walking around Alhambra taking in the sites and getting tons of photos. 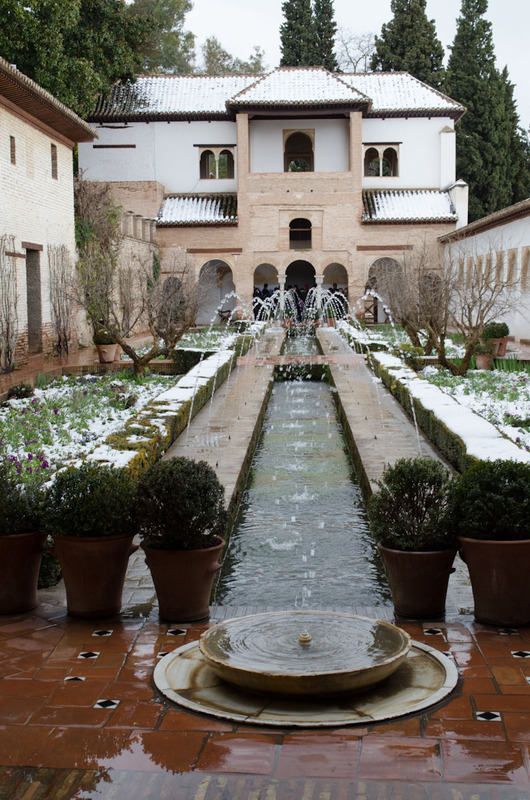 However, Sydney was more interested in snowball fights and the many cats that live at Alhambra. 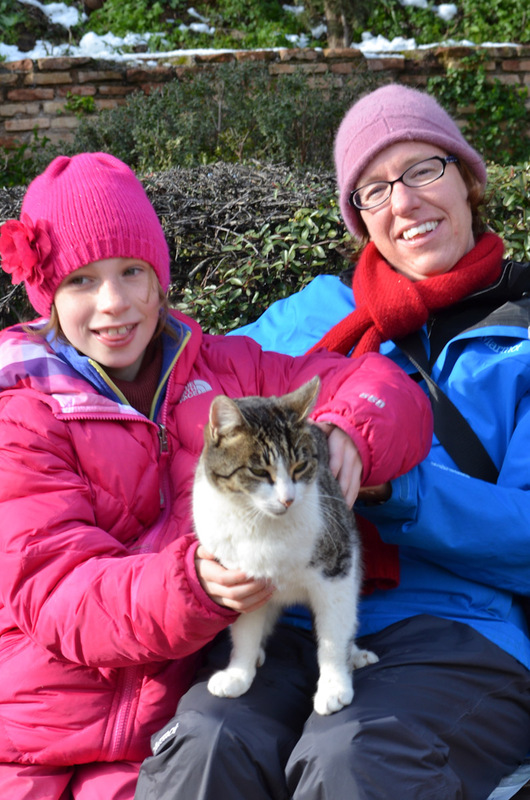 At one point, we were sitting on a bench eating cookies and 2 cute cats jumped up into our laps. Sydney enjoyed petting them and sharing her cookies. If you ask Sydney about her day, she will respond quickly with, “It was miserable!” Hopefully, later in life she will look back at this day fondly and realize what an amazing site Alhambra is. Sounds like a really neat place Kerri! When I saw the picture of the ceilings in the Palacios Nazaries I thought it was a quilt at first. Wouldn’t that make a beautiful pattern for a quilt? Yes! It would make a beautiful quilt. Is this your next sewing project??? If so please, please send me pictures of it! But what a cool quilt it was! Yes, I think it is in the room next to the courtyard of the lions. I totally agree. Pictures will never do it justice. I hope that puddles is doing better 🙁 . Where would you guys go if you went back to Spain? Puddles is doing a bit better. We’ve now got some answers. She has heart problems and an adrenal tumor (but the vet thinks it’s most likely benign). She’s still not out of the woods, but at least she is being treated and she is starting to feel better. She’s acting more like her old self (just very weak). If I could go back to Spain…I would partially want to do the touristy thing and see the best of the whole country again; however, I would also like to be able to pick somewhere and stay there for an extended period of time. 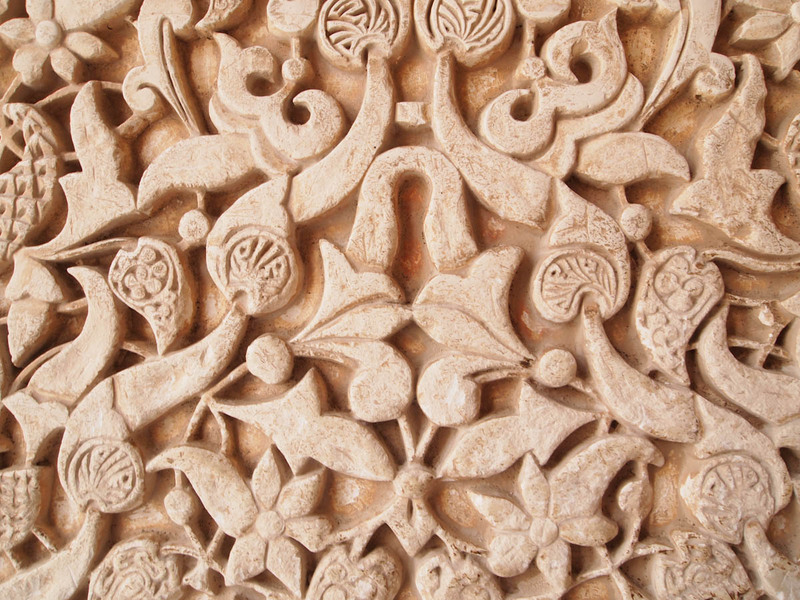 The Alhambra is a must – I MUST do that again. 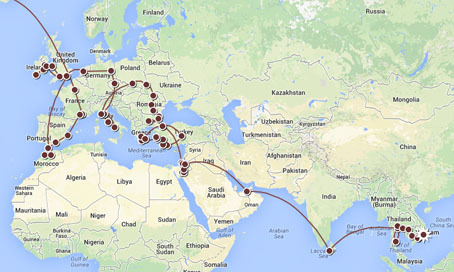 Places that stand out in my memory – Toledo, Segovia, Sevilla, Barcelona, Madrid…Malaga. I’d love to go over to Morocco and see more of that country as well. There is just so much to see and do. I think I’d skip a lot of the cathedrals (I know the ones I saw are historically important, but they get kinda old after a while). I’d want to take in more art related things. The Prado in Madrid. I’d like to see more of Goya and El Greco. I’m a huge Dali fan, so I’d want to go see his works (been to the museum in St Petersburg, Florida). The architecture in Barcelona is another must see. I’d definitely want to seek out more out of the way, less touristy places too. I’d like to get a feel for the real culture of Spain. Glad to hear that Puddles is doing a little better! You made me laugh about the churches and I so agree 🙂 I can’t wait to see the pictures when you go. Morocco is also well worth seeing more off too. Now I just gotta start saving up $ to make that trip happen! I need to find out where Michael’s brother has an apartment! To add to fun travel in Spain, I recommend relaxing in the teterias in Granada. You can smell the mint tea as you approach them. Serene, good service, and often light food. I was in them often to write and relax.